Travelpro Maxlite 3 Int Rollab..
A Honeycomb Framing System and EVA foam construction provide exceptional durability while keeping it super light. The built in Protective skid guards, corner guards and crash-guard wheel housings protect against potential damage during travel and the Airline-grade Telescoping aluminum handle with two stops at 38 inch and 42.5 inch ensures a comfortable roll for users of different height. Limited Lifetime warranty Model No. 401132001 (20 Inch - Black), Model No. 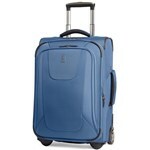 401132002 (20 Inch - Blue), Maxlite3 - 20"" International Carry-on Rollaboard Features: 20"" International Carry-on Rollaboard, Polyester Fabric w/ Water & Stain Resistant Coating, Ergonomic High-Tensile-Strength Zipper Heads, Airline-Grade Aluminum Handle Locks - At 38"" & 42.5"", Honeycomb Frame System - Provides Light Weight Durability, Top, Side & Bottom Carry Handles, Up To 2"" Tapered Expansion Capability - Keeps Center of Gravity Low, Adjustable Hold Down Straps, Sealed Ball Bearing Wheels, Full Length Interior Lid Pocket, Side Accessory Pocket, Built in Ticket Pocket, 9""L x 14""W X 20""H"